It is difficult to think of a more enjoyable way to end a meal than with a decanter of Vintage Port. It is the perfect wine to serve when the guests are at their most relaxed and can give the Port, with its sublime flavors and aromas, their full attention. Because Vintage Port is such a complex and multidimensional wine, it is generally enjoyed on its own or sometimes with a simple accompaniment such as a plate of walnuts, dried fruit, or candied orange peel. However a young Vintage Port is also one of the best wines to enjoy with cheese, particularly blue and other ripe fully flavored cheeses. Vintage Port is widely regarded as the perfect wine to enjoy with a cigar as its subtle and complex flavors create a magical blend with the delicate aromas of the smoke. 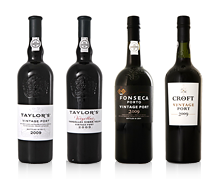 The amount of Vintage Port bottled by each of the top houses is also relatively small. The geographic spread of interest in Vintage Port – which for many years has ceased to be concentrated mainly in Britain – also means that the amount of Vintage Port made now has to be spread more thinly with individual allocations being correspondingly smaller. One tradition is that the decanter of Vintage Port is passed clockwise round the table, never traveling back in the opposite direction. This does not have its roots in any arcane superstition or strange historical event. Neither is there evidence that it makes any difference to the taste of the Vintage Port. It is simply intended to ensure that everyone has a chance to enjoy the wine and no-one gets left out.